Malayala Manorama which has already become the household name among malayalis is known for its reliability and spectacular service. More than being a publisher of the leading daily, the M M group has managed to dominate various reading circles with their various publications. Added to the most accepted publications like Vanitha, The Week, Tell Me Why and Thozhilveedhi, the magazine 'Veedu' which feature about home and interior is gaining more popularity. Unlike other magazines of the genre, each edition of Vanitha Veedu is a complete treat for the readers packed with amazing reservoir of plans, articles and tips on homes. Started in 2007, Vanitha Veedu is compiled by experts and covers every aspect of building a home, modernizing or beautifying it. Having a core team of connoisseurs skilled in working out interesting topics, each issue of the magazine keeps the readers intact. Vanitha Veedu would be the perfect choice for modern people who wish to give a signature touch to their dream homes. For choosing a plan, selecting floor-tiles and deciding the architect to design the kitchen, the magazine serves as a companion for the present generation. 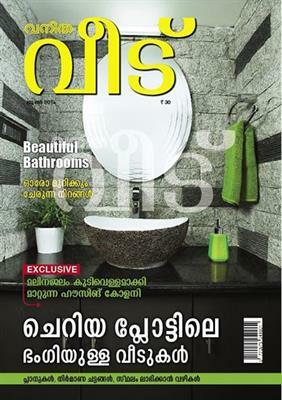 This magazine highly influences all classes of people who are interested to keep their homes eye-catching. Each issue of Vanitha Veedu is treated as a collector's edition for its incredible plans and majestic articles which are worth for whole life. Designed with perfection, the magazine comes with the most sophisticated multi colour design. Like other publications from the M M Group, 'Vanitha Veedu' too has achieved the target of reaching maximum readers in minimum time. People keep high interest in reading the magazine for its innovative approach in bringing out stories of those homes build with unique concepts. Published once in a month, 'Vanitha Veedu Magazine' is worth for money which can poke your brain pouring new ideas in building homes.